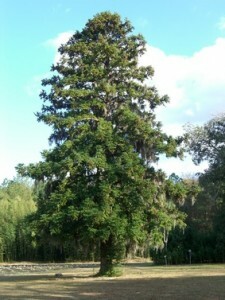 China-Fir is an evergreen generally reaching 30 to 75 feet in height. Bark is grayish brown, longitudinally fissured, and peeling to expose the aromatic, reddish-brown inner bark. Branches are whorled, spreading, and pendulous at the ends. Leaves are 1-3 inches long, gradually tapering to a sharp point. The leaves take on a bronze hue in the autumn and persist on the tree for many years, giving it a somewhat unkempt appearance according to some horticulturists. Trees are monoecious. Male flowers yellow-brown and cylindrical in terminal clusters; females are globuse, yellow-green and terminal. Cones are 1.5 to 2 inches across, have pointed scales, and usually together at the end of branches. Occasionally the tree will have several trunks arising from the soil. Although China-fir is not native to the United States, it is distributed across the South and up the coast of California. It is best used as a specimen, at the corner of a large building. It works well in oriental gardens and the foliage keeps well indoors in a vase of water. It is too big for a residential landscape but useful on campuses and other large-scale landscapes.